The Bombardier CL-600-2E25 aircraft is marketed as the Bombardier CRJ1000 NextGen jet. CL-600-2E25 is the official model name for the CRJ1000 regional jet. The model name is used primarly by aviation regulatory agencies, airlines and companies that work with the jet. If you look at most of the regulatory documents for the CRJ1000 NextGen you will see that the model name is used almost exclusively, instead of CRJ1000. Also you may see the airplane being called the Canadair CL-600-2E25. This is due to the original CRJ series jets being built under the Canadair name / division. The CRJ1000 is certified with Bombardier's name, so the official model name is the Bombardier CL-600-2E25. All previous CRJ series jets also have this name change reflected in the Federal Aviation Administration (FAA) aircraft registry. The CL-600-2E25 airplane is a twin engine, T tail, regional jet assembled by Bombardier Aerospace in Canada. The aircraft was officially launched on February 17, 2007, with the first flight occurring on September 3, 2008. First delivery happened on December 14, 2010 with Air Nostrum and Brit Air taking delivery of the first two CL-600-2E25 jets. The CL-600-2E25 can seat up to 104 passengers. Most airlines choose to equip the jet with 100 seats in a one class configuration. For more information on this commercial regional jet visit the direct links to the CRJ1000 pages, listed below the picture, to locate more information on the jet. All information on the CL-600-2E25 is posted on the CRJ1000 aircraft pages. Above CL-600-2E25 photo by Aldo Bidini on Wikimedia Commons. Photo released under the GNU Free Documentation License, Version 1.2. Detailed overview page on the airplane. Learn about the history of the CL-600-2E25 aircraft and more. Get detailed information on the CL-600-2E25 specifications here, including speed, fuel capacity, payload and more. Details on the dimensions for the CRJ1000 regional aircraft. Information on the CRJ1000's turbofan engines, which are from the General Electric CF34-8C5 series of engines. Range information on the CL-600-2E25's range for all variants of the jet. The CRJ1000 ER is an extended range version of the jet. Learn more about the CRJ1000 ER (Extended Range) jet on this page. See the interior of the CRJ1000 NextGen airplane and learn about the features aboard the regional aircraft. Learn about all the operators of the CRJ1000. 4 airlines currently operate the aircraft. Learn about pricing for the CRJ1000 aircraft at the page listed above. Find out about the performance of the CL-600-2E25 regional jet, including the speed, range and more for the airplane. Learn about the total orders for the Bombardier CRJ1000 NextGen and who has ordered the aircraft. Learn what the NextGen designation, listed after the aircraft's name, means. See the cockpit of the jet and learn about the all the components that are inside the flight deck. Here you can see the seat map of the CRJ1000 for the airlines that operate the airplane. The jet is usually equipped with 100 economy class seats. Bombardier CL-600-2E25 Air France HOP! The Air France HOP! CRJ 1000 page has information on Air France's HOP! pperation and their history with the CRJ1000 aircraft. Learn about Brit Air's operation of the CRJ1000 airplane. 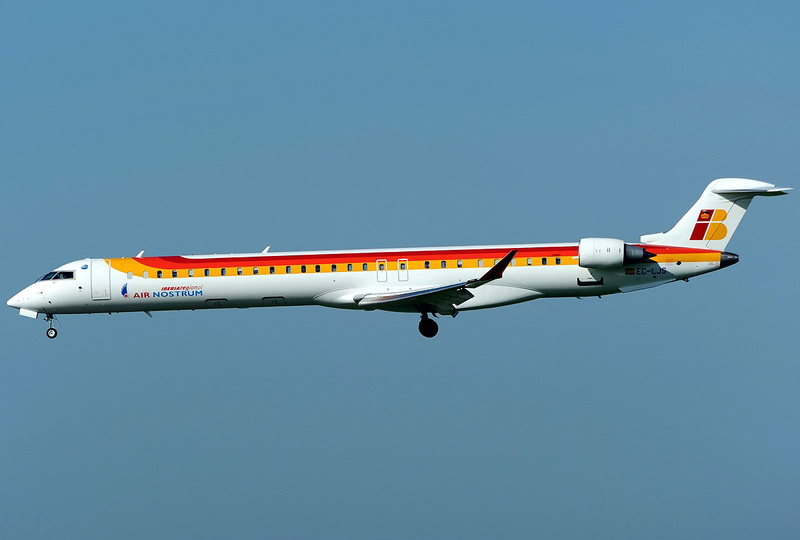 Find out about Air Nostrum's CRJ1000s and their history with the regional jet. 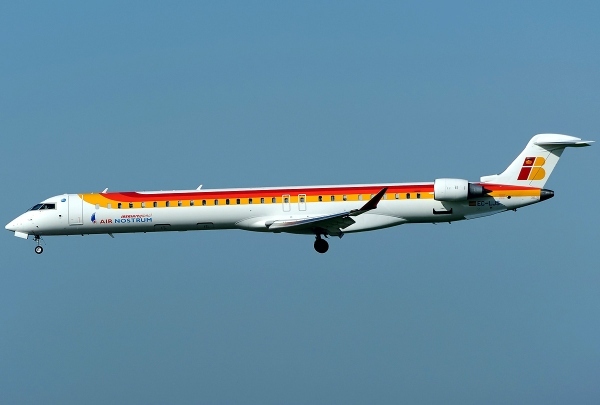 Details on the Iberia Regional CRJ1000, which is operated by Air Nostrum for Iberia. Find out if Delta Air Lines operates the CRJ1000 on the page above. Information on the Garuda Indonesia CRJ-1000 jet can be found at the page listed above. Does Lufthansa operate the CRJ1000 regional jet for their flight operations? Find out if they do on this page. Get the details on the fuel burn of the CRJ-1000 at the page listed above. Learn about the Bombardier CRJ 1000's landing gear at this page. Learn about the CRJ 1000 type rating, designed as CL-66. Also learn who provides training to earn the the type rating for the jet.